Organic Food – Bah Hum Bug! Yesterday, I had a “spirited” conversation about food with a colleague -specifically organic food. There were some glaring problems with our mutual understanding of some main points that were key to our conversation. My discussion opponent was under the impression that the organic food they buy supports “small farms and local growers.” My response to that was “Anything you buy from Wal-Mart is not from a small batch producer.” This was met with anger and disdain. I then posed the question “What is organic food?” This innocient question was answered with “anything grown or raised without pesticides or herbicides.” (fertilizer omitted from their answer) I countered with “What about GMO (genetically modified organism) plants, are they organic if you don’t spray they with anything?” Again, my query was met with anger and frustration. That is when it hit me. THEY DON’T KNOW! THEY SIMPLY DO NOT KNOW! So, as a public service I am going to post some things to pull some of you from your “too cool for school poser status” into “informed consumer” status. Pay attention! A term that has acquired the meaning of foods grown under natural conditions (without the use of inorganic fertilizers, pesticides, or herbicides; and either not processed, or processed without the use of additives). The term, when used on food labels, has no legal meaning. “Organic agriculture is an ecological production management system that promotes and enhances biodiversity, biological cycles and soil biological activity. It is based on minimal use of off-farm inputs and on management practices that restore, maintain and enhance ecological harmony. “‘Organic’ is a labeling term that denotes products produced under the authority of the Organic Foods Production Act. The principal guidelines for organic production are to use materials and practices that enhance the ecological balance of natural systems and that integrate the parts of the farming system into an ecological whole. “Organic agriculture practices cannot ensure that products are completely free of residues; however, methods are used to minimize pollution from air, soil and water. So, looking at that info, it is not a valid argument to say that “Organic Food” is free from pesticides, herbicides, and man made fertilizers. I agree it may have less contaminants than “non-organic” foods, but not ZERO. GMO Seeds: Organic or Not? I will yield to The Organic Center on this one. We are frequently asked are GMO foods organic? The short answer, no. If a food is created from a GMO (genetically modified organism) seed it is not organic. Why? Because genetically modified seeds have been engineered to produce their own insecticide or resist weed-killing herbicides. In addition, according to the Non-GMO Project “GMOs are organisms that have been created through the gene-splicing techniques of biotechnology (also called genetic engineering, or GE). This relatively new science allows DNA from one species to be injected into another species in a laboratory, creating combinations of plant, animal, bacteria, and viral genes that do not occur in nature or through traditional crossbreeding methods.” However, please note that not all non-GMO seeds are actually grown organically. A farmer can use a non-GMO seed and spray it with all kinds of pesticides, herbicides and use synthetic fertilizers and the seed will still be non-GMO, but it will no longer be considered organic due to how it was grown. You decide for yourself who is profiting here. 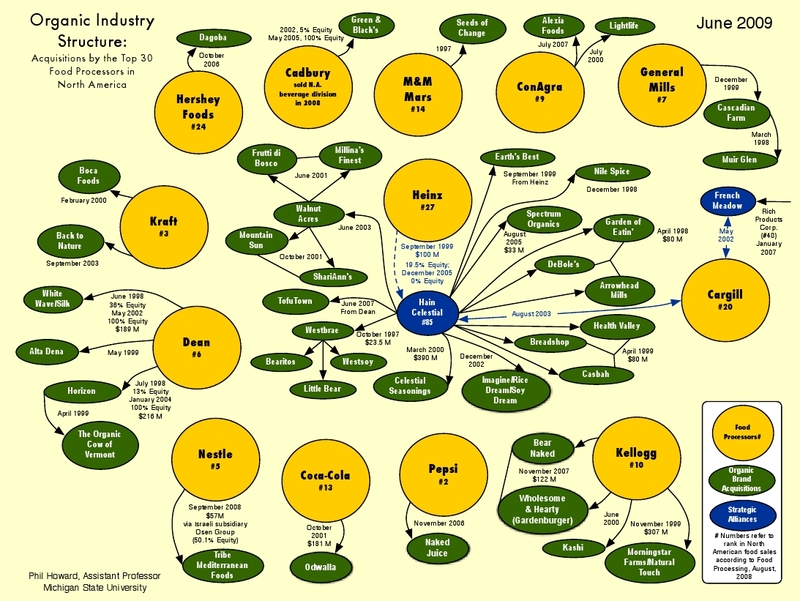 This is a chart showing which BRANDS own what ORGANIC LABELS. Any look familiar? Print this out and take it to your local supermarket and compare labels.